The Ning Groups main page can be the hub of activity in many networks on Ning. Each group listed on it can include discussion about some extremely specific topics. To get to the Groups page, click the Groups tab in the top navigation bar of your main Ning network page. 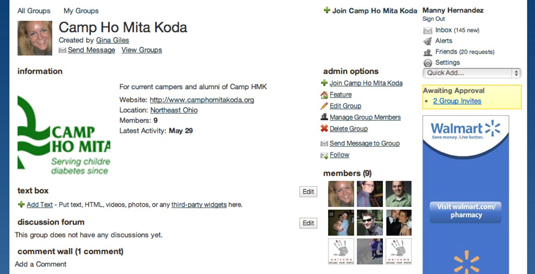 Featured groups: Shows any groups that the social network admin chooses to feature at the top of the page. Other groups: Depending on how active members have been creating groups, you may find anywhere from a handful to thousands of groups that range from a few members each to a ton of people participating. Search for a group: Enter a search term in the search box at the top of the All Groups section and press Enter. Sort the groups: You can change the default sorting order of the most active groups by selecting an option from the Sort by drop-down list. You can change the order to show you the ones with groups latest activity, the ones with the most members, and the most recent ones. 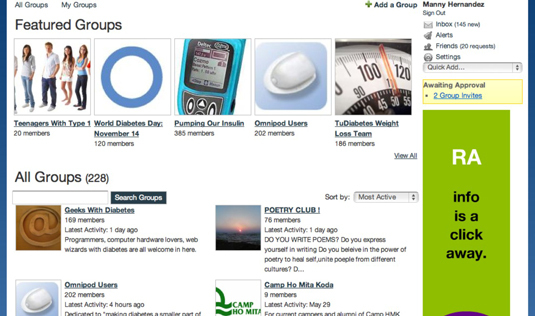 Below the search box and Sort by drop-down list, you can find the listing of groups. Each group sports an image, its name, number of members, latest activity date, and a short description explaining its focus. Public: You can join the group by clicking the Join link at the top-right of the page. Private: If the group has been set up for moderated membership, you’re presented with an option to request access to the group. The group’s creator or administrator needs to approve this request before you can join the group and take part in it. After you join an open group or get approved as a member of a private group, as long as your e-mail settings allow it, you receive a notification via e-mail, confirming your membership.